Samuel’s rescue medicine has been Midazolam for a very long time. I think most (if not all) of the epilepsy world know about Midazolam. Samuel has had it since the beginning where he was given it several times a day – until his seizure treatment plan was tightened and he wasn’t given it for every single seizure. It’s always worked well. It does the job. If he exceeds his protocol (I will post that on here sometime in case anyone is curious) he gets a sqiurt of the prefilled syringe of Midazolam into his cheek. It generally works. But as Samuel has got older it’s had a more noticeable effect on his breathing and that was why we now have oxygen cylinders at home (and an oxygen protocol). The other issue with having Midazolam in our armoury is it’s relationship with Clobazam. Now we love Clobazam. It’s been one of Samuel’s epileptic medicines for a long time and it is very effective. He has it twice a day and it is one of his most crucial medicines. But Midaz and Clobazam are almost like sister medicines. Give them too close together and you are at risk of over sedating him (which could effect his breathing), or as they work with the same receptors of the brain, Midazolam can almost dilute Clobazam making it less effective. Prior to Samuel being admitted to hospital before the summer, he had earned himself Midazolam three days in a row. Not ideal. Think it was a contributing factor to why he got so poorly and had to be admitted. So this is where Paraldehyde comes in. It was my suggestion to Samuel’s doctor about the possibility of introducing Paraldehyde as either an alternative to or replacement of Midazolam. Dr H thought it was a good idea (I occasionally do have them) and we agreed that we would trial it to see if we found it effective and it did the job adequately. Well it did, and it is now Samuel’s first rescue medicine (although we will still continue to have a good stock of Midazolam in the cupboard as back up). Now you might be thinking, ‘why didn’t you have Paraldehyde before given that Midaz is obviously quite a dirty drug?’. Unfortunately you don’t give Paraldeyhyde in quite the same way as Midazolam. It’s given rectally, plus the medicine smells. The moment you open the bottle the room is filled with, let’s just say, a unique smell. Once the bottle has been opened you have to act quickly and fill the syringe (which has a tube attached) and ‘insert’ immediately. You need to be quick as the medicine will block the syringe and wont be useable. On the wards they use to give the medicine in glass syringes but I guess budget cuts and health and safety stopped that and now you’ve just got to use it fast. It’s not the perfect drug (are any of them? ), but it’s the lesser of two evils. Unfortunately given the terrible summer Samuel had I’ve gotten very experienced (and quick) at giving it, so don’t think much of it. The only thing that bugs me about it is the way it makes him smell of it for the next few days. It’s like it fills his pores and makes his breath smell. But it doesn’t stop me going in for a smooch. NOTHING would stop me giving my boy a big fat kiss! Midazolam has been in our lives since the early days. It has become a very important part of our armoury in the battle against Samuel’s seizures. It is his emergency drug. The protocol of when to give Midazolam to Samuel is if he’s had a seizure lasting more than 10 minutes or if he’s had a cluster of four or five short ones in half an hour. It is only given for full on focal seizures and not his general twitching. In the very early days, Samuel had Midazolam a lot. On average he’d have about five doses A DAY! There wasn’t really a clear protocol at that time so he was given it almost as soon as he’d seizure. Problem was, Samuel would seizure a lot and medical staff are trained to zap seizure activity immediately! But the neurologist stepped in and changed the rules. She made us and his hospital team wait. It was hard. I’d be there holding my boy who’d been having a seizure for 8 long minutes and I wasn’t giving him anything. But it worked. It showed us all that more often that not, Samuel will self resolve after about 10 minutes and then be fine. 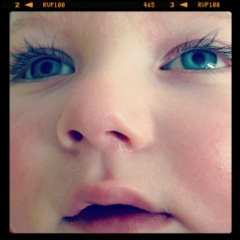 When the going is good and things are quite balanced, Samuel on average has Midazolam about once every two weeks. Although when the Ketogenic Diet was at it’s best he went without it for about 60 days! 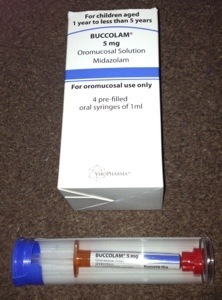 Midazolam is the only thing Samuel has orally. It is squirted into his cheek and absorbed that way. After Samuel has been given it, he can take a bit of time to wind down. Sometimes he will even have another seizure after he’s had it. But then he eventually calms down and relaxes and usually goes off to sleep for about three hours. Giving Midazolam is at last much easier after the introduction of pre-filled syringes. Before, Midazolam came in a little brown bottle and you would have to push the syringe through the stopper to draw up the Midazolam. This wasn’t always as simple as it sounds. There was always a big label over the bottle making it awkward to see what you were doing, if you’d already used the bottle a couple of times and the liquid was getting low, you’d have to angle the bottle a certain way to ensure you got enough in your syringe. Then you have the problem of air bubbles. When drawing up a medicine, you have to get rid of air bubbles as where air bubbles are, medicine isn’t. Don’t forget this is an emergency medicine. You are trying to do all this as quickly as possible too! So at last we have pre-filled syringes. All you do is remove the seal of the tube, take out the syringe, break off the tab and it’s all ready to give. We have a bit of a love & hate relationship with Midazolam. We love the effect it has. How it works. How it stops what is happening. But we hate it too. We hate having to give it. We hate what it symbolises…that Samuel’s had a bad patch. But the relief you feel when you’ve been watching Samuel seizure for over 10 minutes and then suddenly he stops, relaxes and yawns and goes off to sleep. All is calm. Samuel is safe and content once more. That is why Uncle Midaz is a very important part of Team Sam. It’s been a while since I updated you on how Samuel is doing on the Ketogenic diet, so I thought I’d bring you up to speed. Right, where to start. Things have been going quite well. Samuel had been having only a few seizures a day, mostly (if not all) in the evening and, I can’t believe I’m saying this, but we’ve had a few (just a few but even one is amazing) seizure-free days. As I write this, Samuel has so far gone 59 days since his last dose of his emergency medicine Midazolam. Pre-Ketogenic diet he averaged 14 days between doses, so we think this is pretty damn good. Over the last few weeks we had noticed that his ketones had stuck on around 0.8. This is much lower than we’d like but the diet was still having a positive effect so we weren’t worried. The thing to make note of is what Samuel is actually doing rather than what the numbers say. But, over the last week we’ve noticed more seizures have crept in during the day and although they may be short, they are very sharp and seem to unsettle him quite a bit. We’ve also noticed that he might have lost some weight. Samuel has always been like me, long and lean, but lately we’ve felt that he seemed a bit less podgy in certain areas. Anyway, we got him weighed and sure enough he’s dropped some weight, which was particularly frustrating as we’ve been trying to fatten him up. But don’t worry reader, we think we are on to it. Today we handed in two poo samples to the hospital. One is to check whether Samuel has an infection which could affect weight gain and possibly ketone levels. The second sample is to check for fat globules in his poo – it could be that Samuel is effectively pooing out the fats so therefore he isn’t benefiting from them (this is what the dietician thinks the problem is, especially after seeing the consistency of his poo). If this proves to be the case, they can give Samuel a supplement which will him help him properly absorb the fats. While we wait for the results, we are changing Samuel’s feed from powder to liquid. It is essentially the same feed, but there is thought that sometimes children who use a powder or liquid feed, tolerate one better than the other, so we are giving it a try. The liquid form of the feeds contains more fibre, so that might add a bit of extra excitement to nappy time! Drug wean 1 update – We are in the processing of weaning Samuel off one of his drugs, Topiramate. The wean is going well and sometime mid-September, Samuel should be off the medicine completely. He will still be on two anti-seizure medicines but the fantastic thing is that for the first time we wont be replacing this drug with another seizure medicine. UPDATE: Since posting this, Samuel’s seizures have got worse and we had to give him Midazolam on Friday afternoon, ending his fantastic 60 day run. His poo nappies have got worse too, so we are hoping that once the lab results come back we can then start him on the supplement to help him absorb his fats better. We had to give Samuel his emergency medicine Midazolam today. You may think that wouldn’t be something to celebrate, but what we are celebrating is that has been 50 days since we last had to give it to him. 50 days. Samuel’s ‘normal’ average was previously 14 days. We are so very proud of him. That boy is one hell of a fighter. We are so proud to be his Mum and Dad. It is our greatest privilege. I have absolutely no idea where I should start with what I want to say, what I want to tell you. In my previous blog post A day to remember, I told you that for one day last Friday, Samuel had no seizures. None. Zilch. 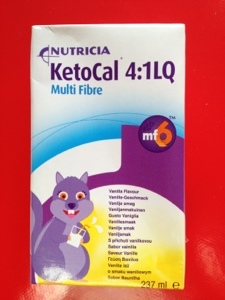 I couldn’t understand it because his ketones were so low (to anyone new reading this, Samuel is on the Ketogenic Diet – pop over to my ketogenic blog posts page for a quick round-up of what’s it all about), so it couldn’t be the new diet. But it wasn’t all plain sailing. He was miserable. Grumpy like I’ve never seen him grumpy before. But by Friday evening we realised why. The area around his gastrostomy site was very red, angry and sore looking. Plus the tip of one of his little fingers was very red too. We took him into hospital Saturday morning (and spent 5.5 hours there waiting to be seen and then waiting for antibiotics) and were told that he had a skin infection. That would explain why he was so very grumpy. And we discovered that infections can reduce ketone levels which is why his ketones were so very low. (For those who still haven’t got their heads around ketones or haven’t been over to my Ketogenic pages to find out more – basically we need Samuel’s ketones to be high and at a consistent stable level for him to be in ketosis and therefore for the diet to work). But dear reader, and perhaps this is the point of the post, so well done for sticking with me, you will be rewarded, Samuel didn’t have a seizure on Saturday either. And this time his Dad was there, so I have a witness. He didn’t have one seizure on Saturday. And Sunday? Sunday he did have a one minute seizure but that was all. That was all. 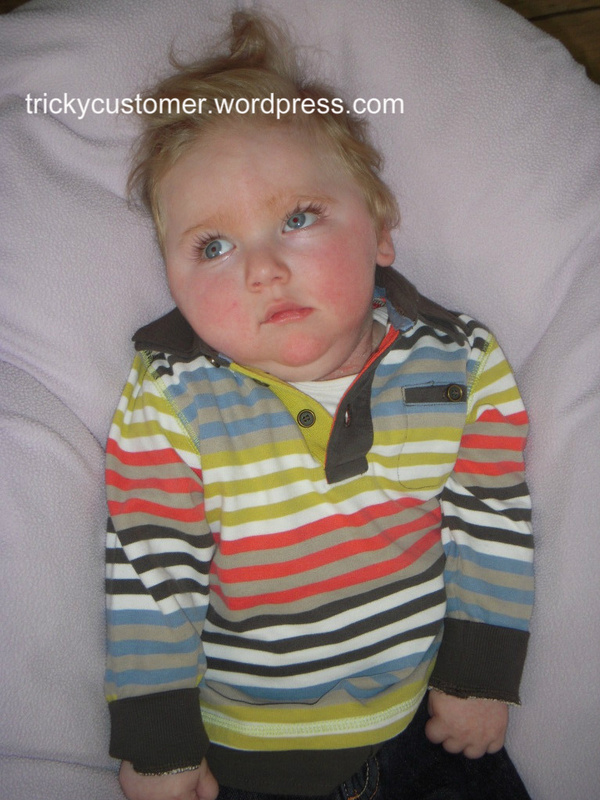 Samuel has severe ‘off the scale epilepsy’ (to quote his padetrician) and has seizures every single day. Well he did. And today? I’m not going to jinx it, but so far he’s had two 30 second seizures and that is all. So is it the new diet? Is it actually working? I still can’t answer that. And it’s not me being coy or over-cautious, I just really don’t know. His ketones are low, very low, so the diet shouldn’t really be working. But it makes me wonder if Samuel is again making up his own rules, even for this new diet. I might blog again and tell you that we’ve had a shocking evening tonight, had to give him his emergency medicine (Midazolam) and the rest of the week is dire. It is normal for us to not have two days the same. What is normal is to have two dramatically different days. So I’m confused. Feeling rather shell-shocked actually. I’m not sure if the Seizure Monster has just gone away on a short holiday and left his lazy assistant in his place. 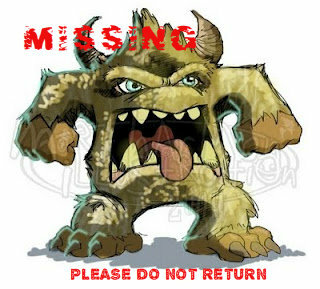 The Seizure Monster may be missing. But we aren’t missing him. 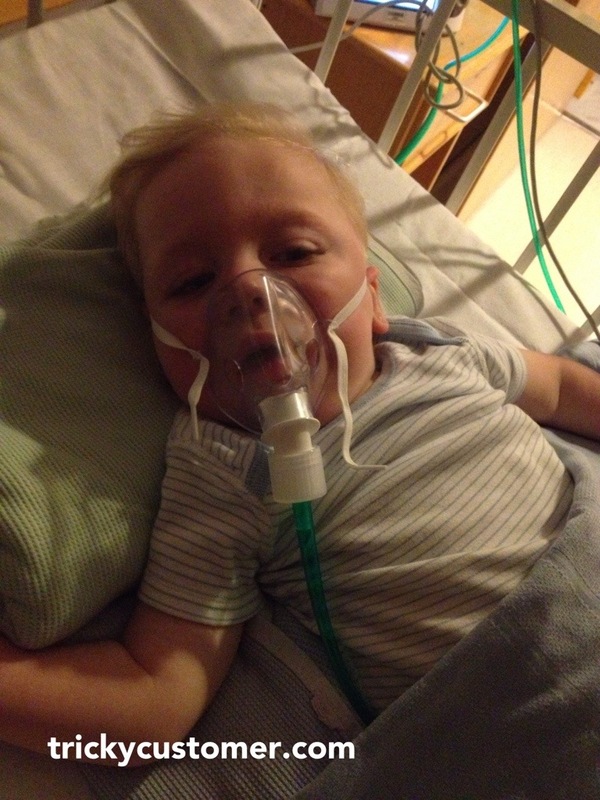 UPDATE (15/05/12) – Samuel didn’t have any more seizures after I posted yesterday, so that was just two small ones he had yesterday. Today? Well, it’s 8pm and Samuel has only had three very brief seizures today. You may be thinking, ‘well three seizures, that doesn’t sound good’. 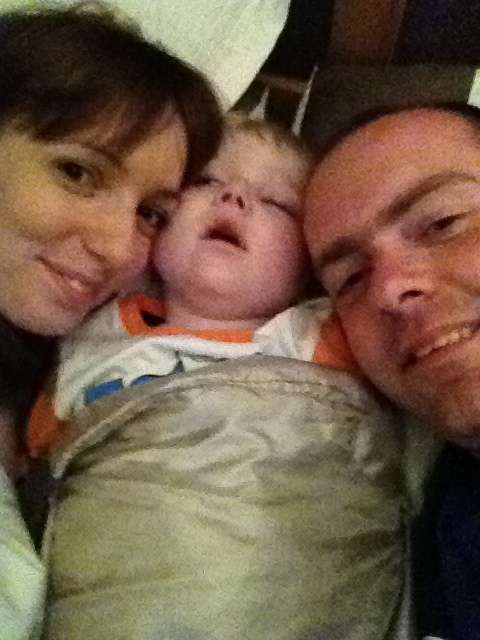 But three very short seizures in one day, for Samuel, is brilliant. Whatever happens tonight or tomorrow, I am such a very proud mum. More information: If you want to find out more about the Ketogenic diet, please have a look at Samuel’s Ketogenic journey and you can also read a round-up of all my blog posts about Samuel’s Ketogenic adventures. Matthewsfriends.org is a fantastic resource full of really useful information and case studies about the Ketogenic Diet. As you know we are in hospital for Samuel to start the Ketogenic Diet. 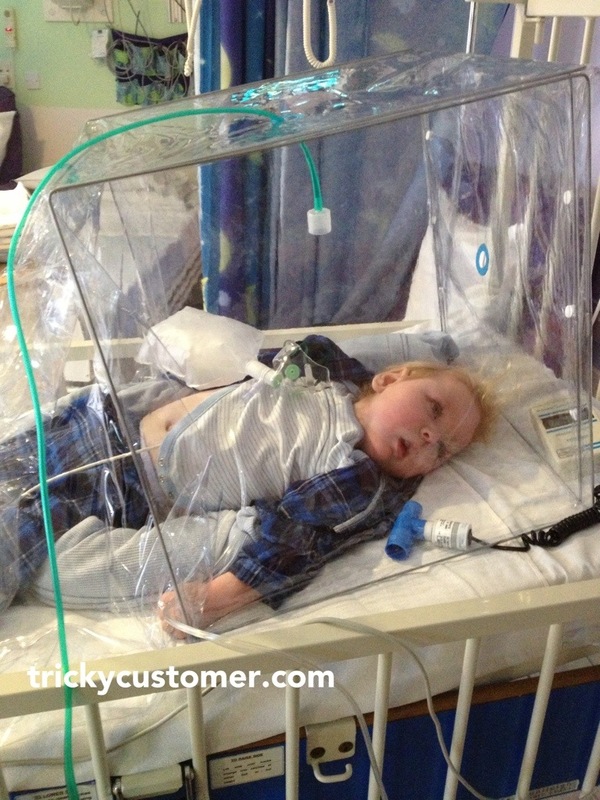 I wrote in a previous blog post, Tricky Customer, that I was mainly nervous about the doctors and nurses and their approach to Samuel’s epilepsy. I’m all too aware that Samuel has unusual epilepsy and that you don’t medicate all his seizure activity (because that would mean you’d be sedating him every single day when he does usually come out of the seizure by himself). But nurses and doctors are trained to resolve seizure activity as soon as possible. To add to it all, Samuel didn’t have a great start to the week. We came into hospital on Monday and that evening we gave him Midazolam. But we, as in his Dad and I, decided to give it to him. He also had another dose on Wednesday which was given under my instruction. And that’s been the theme for this week. Everyone has been told to follow our lead and it is up to us to decide when to give the emergency medication. In fact we’ve been pretty much left to it. I’m doing everything for Samuel as I normally do, doing all his medicines and feed plus managing his seizures. They’ve not even taken his medicines from us, they are here in the room with us for me to use when we need to. The nurses are lovely as usual and very interested in Samuel and I’ve told them all about him. They notice his twitches and jerks and I explain that they are normal for Samuel and they tell him that he’s a brave boy and stroke his hair. Being honest I think some of the nurses are relieved they don’t have to make any judgement calls and it can all be left up to Mum. I don’t mind. I don’t mind at all. It’s my job after all and although I might not be trained or be able to do lots of complicated nursing and medical stuff, I’m the best nurse Samuel will ever have. When Samuel was in NICU we would regularly have a nurse called K. I really liked her, she had a great sense of humour (which really helped given the situation) and she was very kind and seemed to be very fond of Sam. I think we’d been in NICU two or three weeks when the head consultant Dr MK asked us to have a chat with him. He told us that they were becoming increasingly concerned about Samuel’s condition and the fact they were finding his seizures so hard to control. At that point he was on a Midazolam infusion and totally out of it. Dr MK told us that we needed to prepare ourselves for the possibility that Samuel would not come home. Ever. We would either lose him to the seizures or that they would be so impossible to treat he would have to be permanently sedated and remain in hospital indefinitely. As you can imagine our already shaky world crumbled. My husband got angry. Not at the doctor but at the unfairness of it all. At the women, pregnant women he saw outside the maternity unit in their dressing gowns smoking. We were both very emotional. We went back out to Samuel’s cot and K sat with us for quite a while before telling us her story. She hesitated at first, I think she was unsure whether it was the right thing to do. But I’m so glad she did. She told us of her baby boy J, who had been born 24 years previously. He had a rare brain disorder, I can’t remember if she told me what it was or whether he had a diagnosis, but she said it was bad. His brain was in a worse situation than Sam’s. He also had a severe cleft palate and in effect was missing his top lip. She was allowed to take him home, but everyone knew it was for ‘family time’ before he passed away. It was almost certain that her boy wouldn’t make it. If I remember correctly, he lived for around 8 months. As she told me this story I kept staring at her thinking, but how are you here, walking, talking, how have you made it through? But the point is, she did. Her experience led her into nursing, she was a hairdresser when she had J, but after what she went through she wanted to help other babies, so she became a neonatal nurse. K told us that things we said in the meeting with the doctor, the things that my husband had got angry about, she had said the same things herself all those years ago. She told me that I must not feel guilty, however hard it is, I must not feel guilty. She said that I must always remember that I brought Samuel into this world and whatever happens I will give him a life full of love. Throughout our time in NICU when things got really bad and I had really dark thoughts I kept reminding myself that K’s been through this and she survived. She somehow made it through and she had worse odds than we did. The fact that she wanted to help other poorly babies made me admire her even more. I don’t think I’ve got it in me to do that. Being a NICU nurse you see just how damn cruel nature can be. Our friend Auntie C, also a NICU nurse, has told me many stories of children she’s nursed and the different conditions. I don’t think I could deal with that cruelty every day. When we finally got Samuel home, my husband and I made a deal. That we would truly treasure Samuel. 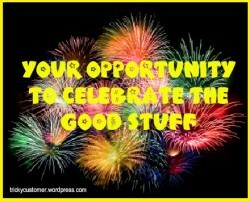 We would enjoy every moment and celebrate the boy he is and try not to mourn the boy he will never be. We made that pact in memory of J. Although he has surprised the doctors that he’s still here and seems to be doing ok, we know that we will outlive Samuel. He wont make old bones. But we’ve got this far and he is a fighter. I know there will be parents reading this that have lost their babies. Samuel is 16 months and maybe their little ones didn’t make it that far. But I promise each and every one of you that we hold and squeeze him so tightly every day and know how lucky we are to still have him here with us. Whatever happens in the future, somehow we will survive. We have to, as Samuel will always be here in our hearts. 8am – Turn off the pump feed & flush through with sterilised water. 9am – Give Samuel his medicines with flushes of water in between – Topiramate, Vigabatrin and Clobazam. 11.15am – Give Samuel his reflux medicine (this is a new thing and I’ll talk about this more another time). Noon – Sam starts his pump feed of good old Pepti Junior. After the feed we flush him through with water. 3pm – Sam starts his pump feed of good old Pepti Junior with a sachet of baby Gaviscon mixed in. After the feed we flush him through with water. 6pm – Sam starts his pump feed of good old Pepti Junior with a sachet of baby Gaviscon mixed in. After the feed we flush him through with water. 9pm – Give Samuel his medicines with flushes of water in between – Topiramate, Vigabatrin and Clobazam. 10pm – Give Samuel his bedtime medicine Chloral Hydrate which helps him sleep and flush with water. 10.10pm – Start his overnight pump feed (500ml to run over 10 hours). and we’ve had to give him some Midazolam. We medicate if his seizure has been going on for 10 minutes or if he’s clustered and had four/five in 30 minutes. Midazolam is squirted into the cheek and then you rub the cheek to make sure it is absorbed. Also this doesn’t include if we’ve given him Calpol etc. It still feels strange when we give him a ‘normal’ medicine as we are so used to it being prescription only and doses tightly controlled. In addition to this I have to do regular care of his gastrostomy button. Turn it every day and give the skin area around the button a good wipe. I also have to replace the water in the button once a week. 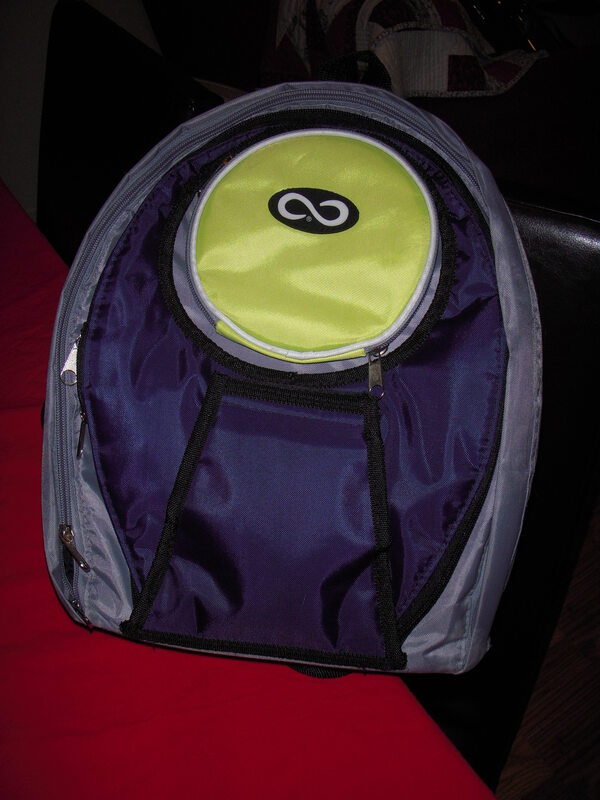 Sam’s pump is very portable, we have a nifty rucksack to take it in so he can have a feed anywhere – the boy has eaten in restaurants, cafes, shopping centres, parks and the car. So there you go. That’s how we roll in our world. Updated to be included as part of the BlogHop #definenormal. Pop over to Just Bring the Chocolate to find out more.